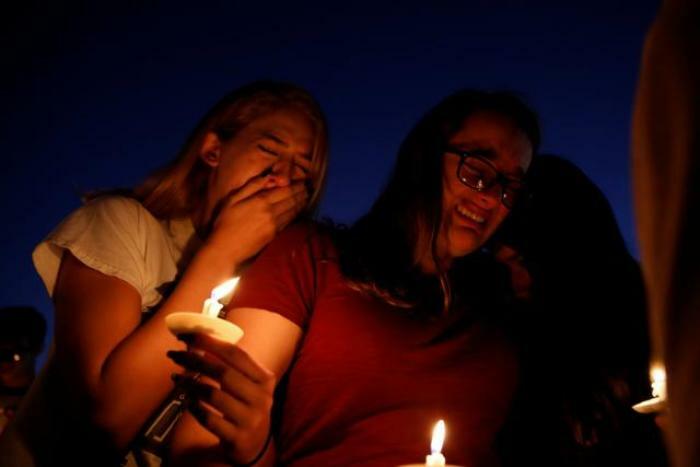 More than 1,000 people attended a candlelight vigil Thursday night where parents shared their heartbreaking grief over the deaths of 17 students and staff killed in the mass shooting at Marjory Stoneman Douglas High School in Parkland, Florida. 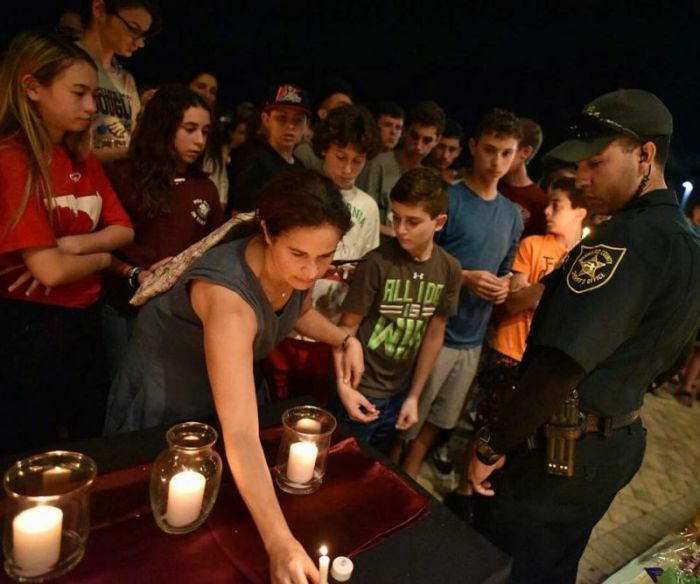 The Palm Beach Post reports that Fred Guttenberg was one of the fathers who poured out his sorrow before the crowd over the loss of his 14-year-old daughter, Jaime, who died alongside 16 others when 19-year-old former student Nikolas Cruz went on a rampage inside the school halls. "This makes no sense," the devastated father said. "This is impossible. My girl, my 14-year-old baby ... For those of you who knew my baby, she was the energy in the room. She made people laugh and, yes, sometimes she made us cry. But she always made her presence known. "I sent her to school yesterday. She was supposed to be safe. My job is to protect my children, and I send my kids to school. In the morning, sometimes, things get so crazy. She runs out and goes, 'I gotta go, Dad. Bye.' And I don't always get to say I love you. I don't remember if I said that to Jaime yesterday morning," Guttenberg continued, with tears streaming down his face. "Jaime was such a special kid. All of the kids here are. What is unfathomable is Jaime took a bullet and is dead. I don't know what I do next. My wife is home. We are broken." The 16 other victims, most of them students, were named by the Broward Sheriff's Office: Carmen Schentrup, Meadow Pollack, Peter Wang, Nicholas Dworet, Christopher Hixon, Aaron Feis, Luke Hoyer, Alaina Petty, Martin Duque Anguiano, Alyssa Alhadeff, Helena Ramsay, Scott Beigel, Joaquin Oliver, Cara Loughran, Gina Montalto, and Alexander Schachter. The deceased ranged in age from 14 to 49. CBS Miami said that close to 1,000 people attended the vigil, with several other vigils also taking place in the area throughout the day. Florida Gov. Rick Scott was among those who attended an earlier noon prayer vigil outside Parkridge Church in Coral Springs. The Thursday night vigil, which drew the largest crowd, included a memorable moment when 17 angels took stage, symbolizing the victims. Many of the residents shared their shock at the tragedy. "This is the park where our children play, now there are crosses around it," said Parkland resident Marilyn Krantz. "This is unfathomable in our community and in any community." Allison Shonk, a student at Marjory Douglas Stoneman, said that Feis, who worked as an assistant coach, used his body to shield students from the gunfire. "I said 'hi' to him almost every morning. All these losses hit really hard for everyone at the school. And, I'm just sorry for all the parents and all the loved ones we lost," Shonk said. Former Stoneman Douglas student Marisa Leal added: "They were my neighbors that we had to bury, or my friend's siblings that we had to say goodbye to. There's really no justice in that except for being there for each other." At one point during the vigil, someone in the crowd began shouting, "No more guns! No more guns!" CBS reported, reflecting the sentiments of some who are pushing for the government to confiscate citizens' guns.